It’s the last Saturday of the month, which means it’s Give a Sh*t Book Club time! 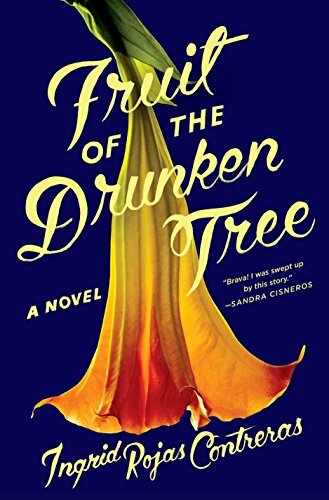 This month our pick is Fruit of the Drunken Tree by Ingrid Rojas Contreras. In recent years it’s become really important to me to do my part as a reader so that I can get the most out of my reading. It’s way too easy as a privileged white American reader to say “I couldn’t relate” to a novel written by someone from a different culture rather than making even a minimal effort to do some research and learn something so that you CAN relate. The Internet exists. We carry devices in our pockets now that can tell us pretty much anything we ask. There’s no excuse for willful ignorance. End rant. I was surprised how much this book reminded me of last month’s book club pick, The Boat People by Sharon Bala, because on the surface they don’t have much in common. But Petrona was in a position that reminded me a lot of Mahindan’s. She had no resources, no support, and very few choices other than depending on her boyfriend, despite his connections with the cartel. It’s easy to condemn someone from the outside, from a position of relative privilege, but the view from inside Petrona’s life was very different. Seeing the events of Pablo Escobar’s life through the eyes of Chula, as a little girl, was an interesting perspective. It brought home to me the terror of living through those times--the memories she had of Galán’s assassination, her grandmother’s relentless fear after the attack she witnessed, and her aunt’s rage that her children had been put in danger. That child’s perspective carries more weight than a news story--it makes it personal, immediate, visceral. While things for Petrona did not end particularly well, I was amazed by her courage and tenacity. I was grateful that in the end she did the right thing in protecting Chula even though it cost her gravely. She found a way to survive. Hope you found Fruit of the Drunken Tree to be a rewarding experience! Comments are open below. Can’t wait to hear what you thought of this one!